Sunday, June 22nd, 2014 . Want to improve how efficiently you do table management? 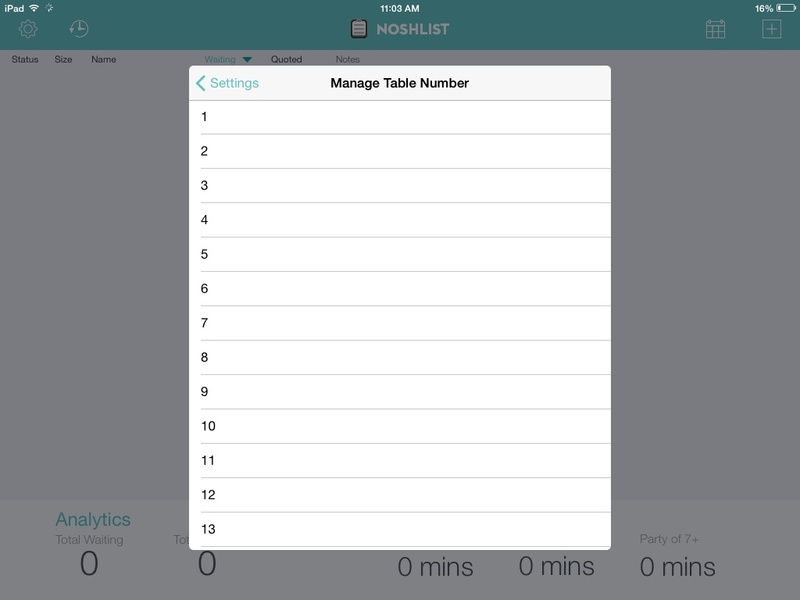 NoshList makes it easy to assign parties to tables, either when they are first added to the list or when they are seated. The table numbers are displayed in the waitlist view, so you can scan the list at a glance and know which parties go where. Table numbers appear in a spinner for quick selection, and by default the numbers will be from 1 to 50. Most restaurants will want to change these numbers to match what they use in their restaurant, and this can be done individually in the app, or all at once on the NoshList website. If you aren’t a restaurant, you can even change table numbers to represent what makes sense for your business. Think of them like a resource that can be assigned to a customer. They could represent the initials of a salonist or salesperson, a number for a barber chair or bowling alley lane, a rental rental ID or code, among others. 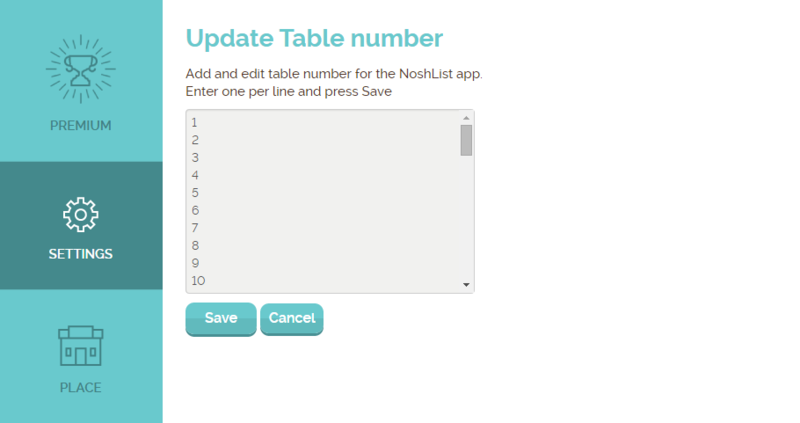 Or you can update them all at once in the settings on the NoshList website. If you have multiple devices the changes will synch so they are the same across all devices, but you will need to just go to the settings page on the other devices to trigger the sync. Sunday, June 15th, 2014 . 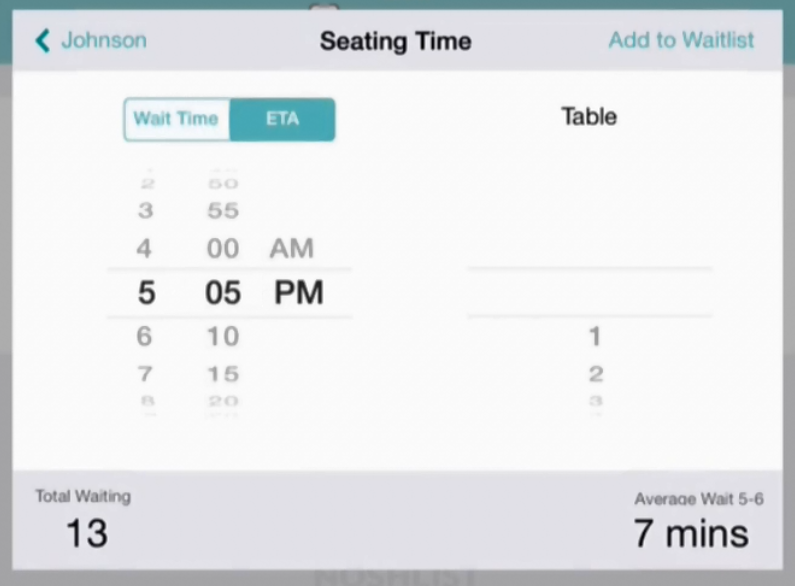 Want to better remember seating requests for waiting customers? Or note which visitors are celebrating special events? NoshList lets you enter any notes you like, and they can be easily scanned from the waitlist view so you can better stay on top of things. They can also be viewed in the customer history view and the downloadable reports. With the new Quick Notes feature, you can define as many pre-set notes as they would like to appear when a party is added to the waitlist. It’s great for common events, such as birthdays and anniversaries, or popular customer preferences, like dietary restrictions. They can even be used for tracking popular items people might order or specific things you may want to track in analytics. The nice thing about QuickNotes is they speed up the process of adding parties because they can be selected from a list rather than typed out. Also, they make it easier to standardize how people enter important information across time and people. Or you can update them all at once in the settings on the WaitList website. If you have multiple devices the changes will synch so they are the same across all devices, but you will need to just go to the settings page on the other devices to trigger the sync. Wednesday, June 4th, 2014 . NoshList Premium Price Reduced to Under $20 a Month. Free Service Limited to 100 Parties/mo. We are happy to announce that we have lowered our NoshList Premium price with unlimited texts and calls by 59% from $49/mo to $19.99/mo. For existing NoshList Premium users, no action is required, and the new lower rate will automatically be applied with the next billing cycle. As part of the pricing update we will be changing our free service, which will be limited to 100 parties a month starting July 1, 2014. The hundred party limit will be based on each calendar month, and when the limit is reached, further parties will not be able to be added until the beginning of the next month. If you haven’t already, sign in and get the upgrade here for $19.99/mo. to start getting all these features. Wednesday, May 21st, 2014 . 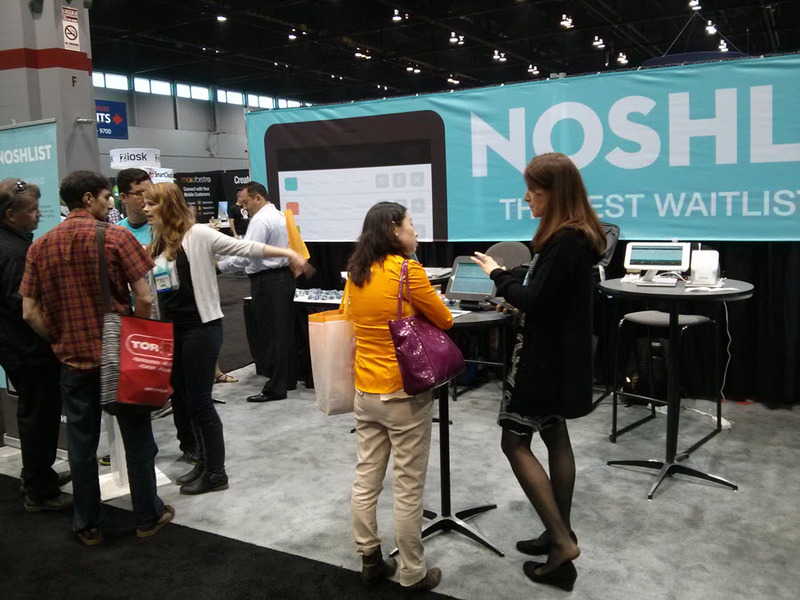 NoshList was excited to return to this year’s National Restaurant Association Restaurant, Hotel-Motel Show (NRA) in Chicago from May 17-20, marking the company’s third year as an NRA exhibitor. There are a number of trends that are changing the way restaurants manage their businesses better with technology, and NoshList has been at the forefront of these innovations. 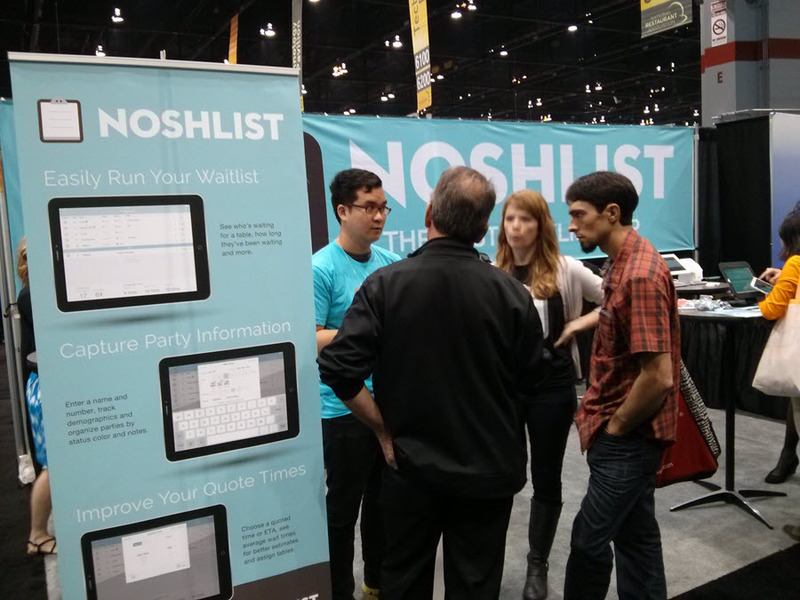 Since last year’s event, NoshList has tripled the number of people seated through the NoshList waitlist app. The NoshList wait list app closed out 2013 with more than 22 million diners seated across 4,000 restaurants. In the first quarter of this year, NoshList seated another 10 million diners, as growth continues to accelerate. We also were one of the first apps to integrate with the award-winning Clover POS device. NoshList got a chance to show off several design improvements and new features in its new iOS 7 and Android apps, and gave a special preview of its new reservations feature for the first time at NRA. Adding reservations to the NoshList app is another way the company is building the simple and intuitive tools that restaurants need to improve their guest experience and operational efficiencies. The reservations feature will be live in the App Store and Play Store within a few weeks. We had a great time at the event, spoke to a lot of interesting potential customers and technology partners, and were thrilled to have a chance to be interviewed by Turn & Burn on the NRA Media Stage. We also had a couple Armor Active stands, which work great with NoshList. Here is a blog post on how they looked. Saturday, May 17th, 2014 . We announced an exciting new integration in January with Clover that puts our NoshList waitlist app directly in front of restaurant operators across the country. 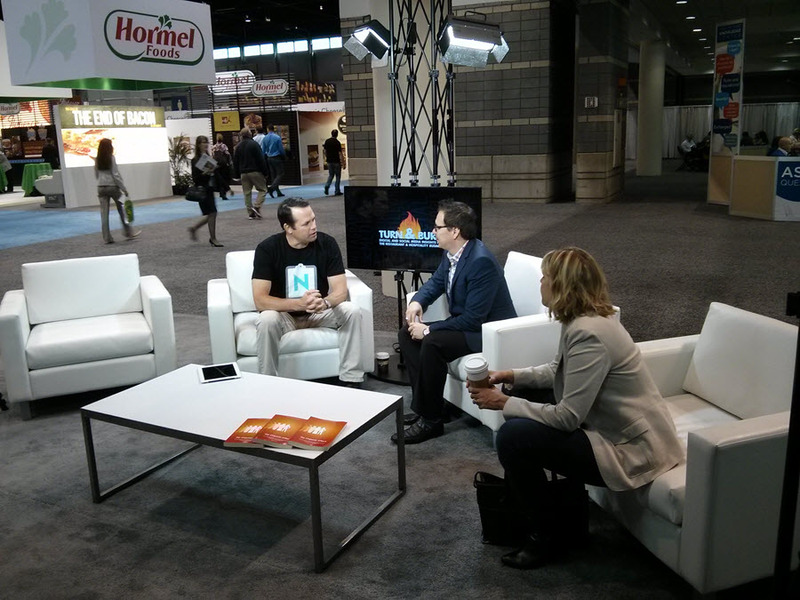 NoshList was one of the first apps to appear in Clover’s newly developed app marketplace. This is new and exciting for us because technology such as the Clover POS is leading the way for restaurant operators to efficiently update and integrate their front-of-house and back-of-house operations. Never before have waitlist apps been able to sync up with a restaurant POS, providing sales analytics based on waitlist names and phone numbers. Now, they can. Clover, owned by First Data, is going after restaurant operators with modest businesses in an effort to treat them like large brands by giving them what they’re asking for: something more from a technology provider without the high price tag to match. Clover is answering this call is by offering a merchant-driven technology tool based on the Android operating system. It’s smarter, more flexible and secure than what many of these operators have been using, and the fact that NoshList is featured as a tool within this technology makes what Clover is doing that much better. For Clover users, the toolkit is future proof and includes a printer, cash drawer and credit card terminal. Additionally, it includes preloaded apps such as ours intended to give restaurant operators the ability to control and customize the tools best suited to their needs. Additionally, we have recently made several new enhancements to our NoshList waitlist app. These updates let restaurant owners and management define pre-set notes, such as dates of birthdays and anniversaries, in the Quick Notes feature. The notes can be viewed in the wait list for easy reference and can be synced across each device used in the restaurant. The new app features a seating history display below the current list and people that add themselves to the list show up at the top with special highlighting to alert the hostess. In addition to the new app features, the NoshList website now has several powerful analytical reports for paid premium users. The reports include an activity overview that highlights diner trends seated by the day, week or month, a visitor breakdown by age and gender, activity logs for custom analysis and loyalty metrics comprised of guests who visit your place when, how often, and their average length of wait. The NoshList and Clover technology is based on flexibility and is a valuable tool restaurant operators can leverage to make their operations more efficient. And integration is easy! When someone installs NoshList from Clover, it immediately pulls their merchant account information and links table orders directly to the table numbers entered into the POS. Restaurant staff can then view the customer’s name, order and visit history, giving them an opportunity to elevate the guest experience through rewards and direct marketing campaigns. 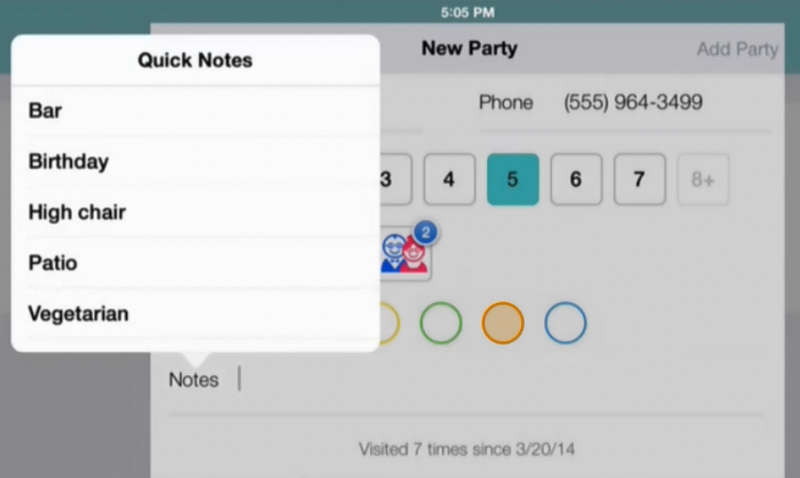 Quick Notes – Easily create a list of common notes to use when adding and seating parties. ETA – Choose an estimated arrival time for same-day reservations and larger parties. Seated View – View notes and parties seated in the main waitlist view. Rich Analytics – Download activity, demographics, party size, and loyalty reports. Table Management – Customize and assign table numbers when adding and seating parties. Customizable Public Waitlist – Add information on daily specials, loyalty programs, coupons, and more to the public waitlist that guests can check from their phones while waiting. With partners such as Clover, we will continue to push the boundaries of waitlist technology because we believe in doing things differently. We are a team of professionals focused to innovate an antiquated aspect of the industry,one we understand, appreciate and are passionate about.